I haven't had much time for crafting lately. Part of the reason is trying to handle three little ones at home. I decided I needed to teach them how to do chores and have responsibilities in the home from a young age if I ever want to have time for myself again. I tried giving them expectations and got frustrated when they didn't follow through. Duh, they're little. My husband can't even follow through with turning the lights off a room when he leaves it! I tried printing simple chore cards with individualized envelopes I got off the Internet and stuck to their bedroom doors. They were all excited about the cards at first, but there really wasn't any way to get this program to stick unless I was overseeing them like a hawk every minute of the day. Finally, I decided I wasn't succeeding at this on my own and that it was important enough to me to justify purchasing a program to handle chores and responsibilities that had a little more logic and procedure built into it. So here is where Accountable Kids comes in. I have to say, the first I came across this program, I thought it was ridiculously expensive. When I realized I was failing miserably at my goal, I decided having a tool to effectively help me instill the character traits I want in my kids was worth the price. Also, there are ways to get discounts, one of which is writing a review for the program. So here it is. The program consists of a book that lays out the structure of the program in a progressive manner. A wooden peg board and and assortment of responsibility cards, tickets, bonus bucks, and a few other types of tickets. It is not too much to figure out because, you start out introducing the most basic concepts to the kids and move on from there. 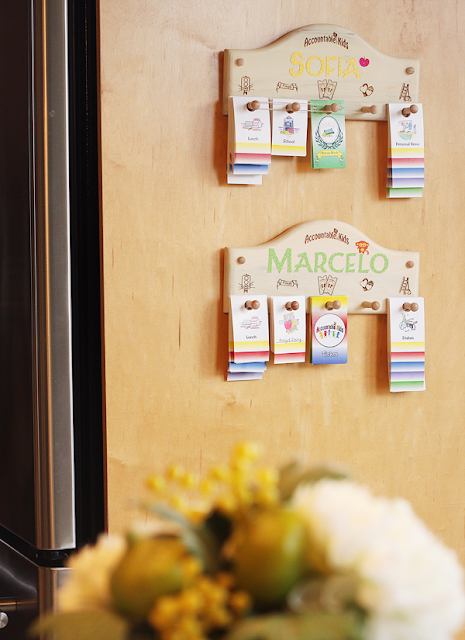 On the peg board, you place whatever chore or responsibilities cards you expect your child to accomplish throughout the day. These have a short description as well as a picture for non-readers. They are color coded, so that you can specify whether they should be completed in the morning, afternoon, or evening for example. When they accomplish the responsibilities in each time frame, they receive a ticket. Tickets are then used to do activities which I would like them to consider privileges rather than entitlements. They can be anything you choose, for us, it is things like watching a PBS show, playing on the computer or iPad, playing a special game with the family, going to a fun place, etc. They can also lose tickets for poor behavior such as whining and fighting with siblings. These are my major peeves. This is the gist of the system, however, there are several more elements that can be introduced over time to continue to encourage the kids to keep up with their responsibilities and earn positive rewards. There is a peg for special chores which can be paid with "bonus bucks". Bonus bucks can be traded for small rewards at the end of the week or exchanged for money with older kids as you see fit. There is also a "special privilege" card that can be used to correct and reward specific behaviours. There is a "best behavior" card to recognize something out of the ordinary without a material or monetary reward. And there is, a special date card that can be used to promote consistent success with the responsibilities over a full week for which the child would receive a special one-on-one date with a parent or other important person. The book that comes with the program outlines this whole system with clear explanations and examples. ﻿The company suggests letting your kids decorate their boards to get them excited about the program. You can order the board with your child's name. I decided to save a few bucks and made their names with paper on the Cricut machine, placed them on the board with re-positionable adhesive (Xyron sticker maker). The boards need to be in a well visited and easy to see spot in the house. OK, so how did things actually go. I hung up the peg boards in the kitchen area for my 7 and 4 year olds with their cards and let them find them the next morning. Their days can be very routine, and they love surprises. I had no fear of the immediate success of the system because I knew they would be excited about this new, personalized thing. When the excitement wore off though, I wasn't sure what would happen. I was right. They immediately noticed the boards with their names and started inspecting the cards. The 7 y.o. quickly figured out the cards where chores for them to do. That's all they knew and they were overjoyed. I'm not kidding. They ran back upstairs to make their beds and get dressed instead of hanging out in their pajamas. They informed me it was now time for breakfast. I showed them how to turn their cards over to the next peg as each item was completed. They were frantic with excitement about their responsibilities simply because it made them feel so darn important! The only trouble for the first few days was when there were no more responsibilities to do for a while. Specially for the 4 y.o. As I said before, I fully expected the system to be a success the first week. The backlash came at different times for the 7 and 4 year old. Once they start losing tickets and then really not being able to do the things they're used to doing, that's when reality sets in for them. My kids reacted with disdain and continued losing tickets until they realized there was no way out but to come full circle back to complying with the system. At times, they were proud of each other for their accomplishments, working together to earn privilege passes so they could have sleep overs in each other's rooms. Other times, they were competitive with each other, basking in the lost tickets of the other. ﻿Before Accountable Kids, I would ask the kids to bring me their laundry baskets from their rooms and then I would sort, return the baskets and do the laundry. Now, they know exactly when it is laundry day. I bought these white foldable laundry baskets at Ikea for a dollar each. I set them out, they bring their baskets and sort their clothes out by color into the white hampers independently and all I have to do is take one hamper load and stick it all in the washer. When the laundry comes out, they help fold their clothes and put it away. Yes, I expected them to do this part before, but sometimes it happened and most of the time it didn't. Now that there is a card associated with it, it's a much more concrete expectation for them. They actually love doing it now and I never have to nag. (I don't normally keep stacks of sheets and towels in top of the machines. We're painting the linen closet). The program has been great. It helps me keep up with my goals and is not easily forgotten. 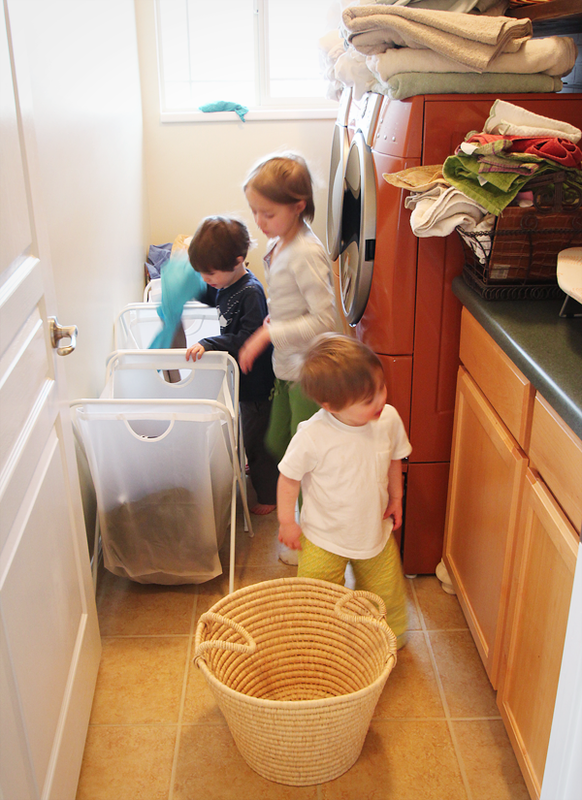 The kids have improved with their sense of responsibility and independence with many of the chores. Particularly morning chores. The 4 y.o. never made his bed before and hung out in pajamas all morning. Now, I never have to remind him to do these two things. For his age, it is a very helpful tool to put abstract expectations into a solid picture based format that he can understand and keep up with. They thrive on the sense of organization this brings to the expectations I have for them. It makes it easier. And, for the things that they continue to have issues doing, it provides a way to focus on these areas to bring about change in a positive controlled way as opposed to the eventual desperate nagging I would resort to before. Among other successes and huge helps is the 7 y.o. now cleans the kids bathroom vanity area. She gets a bonus buck for this one. The first week, she wanted more things to clean and was deeply disappointed she couldn't just keep cleaning all the bathrooms in the house. Now, I'm just happy to see that she is still performing this duty with a smile on her face. I could go on with the benefits we've seen and although there's always room for improvement, it's now easier to identify and focus on those areas. You can start the program as early as three and use it all the way up to twelve or so. The system has really been worth the money. And most importantly, it's not a short term fix. You can continue to add new or different responsibilities and customize it to your child's age and needs. I would give it four out of five stars and that is only because I would love to see it be more affordable for more people, especally those with multiple kids. I bought three peg boards. The other is waiting for the 2 year old to be ready to use it. I highly recommend the Accountable Kids program. Do you still use this program still? How does it hold up in the long term? I've been thinking of getting it for my family. Thank you for asking this. The reality is that through the years, we all have slacked off using the program for various periods of time. Kids, in my experience, thrive on the new-ness of things. So, once the program isn't new anymore, enthusiasm has wained, of course, and they started robotically turning cards over, whether they had completed the responsibilities or not and eventually, when they weren't being rewarded with tickets, not turning them over at all. However, the program doesn't run itself, and half of this issue is really do to the adults continuing to use the program as well as the kids. This issue is addressed in the book that comes along with the program, I believe, and there are various suggestions on how to address it. It's a "management issue" per se. Ha ha. This being said, with the new year, I asked the kids if they still wanted to do Accountable Kids or just put it away. I told them, I was fine either way. They unanimously voted to do it, including the youngest, now almost five, who I have not allowed to do the program because he ripped and tried to eat the cards before. Uh huh. So, we are now on a fresh start of the program and I am very pleased to be following through with it again. It's so much easier to have them give me their tickets when they want to do something or to point them back to their boards when they ask me if they've earned a ticket or not. (I also use tickets to trade for Halloween candy because I'm crazy like that; and this has gone over very well). I still recommend the program. How long it is effective, ultimately lies in how well the adults continue to follow through with the program. And it's OK to take a hiatus from it if no one feels like doing it and just come back to it later, I think. Hope that helps!